The remix is a machine art! Art is dead, long live to the machine art. Vladimir Tatlin. ‘Machine’ is one of the principal concepts of the modernity. Machine is accurately described, by Broeckmann, as a productive assemblage of forces towards a non-teleological end [1, p.195]. This concept has determined the fate of all sort of practices aimed at producing, organizing, planning, designing, and/or projecting all sort of objects, spaces, social structures, sonic rhythms, and visual sensations in the western societies along at least the last two centuries. In spite of the heterogeneity of forces that are assembled, this concept is totalizing because first, it covers production, organization, and serialization; and second it encompasses all forms of creative work that are treated in similar manners and usually tends towards homogenisation into an uniform social structure at the the same tic-tac-rhythm. The machinic is the principle that specifies these assemblages, it differs, for instance, from mechanical, electrical, and digital because it covers all of them as characteristics of different sorts of machines, to determine then that what matters is the kind of work the machine does. Let’s take as example a combinatory machines such as a blender. In a blender different fruits are mixed to produce juice, thus a mix is a homogeneous surface resulting from the assemblage of dissimilar sources. Clearly, a blender could be described as a mechanical machine but mechanical is not enough when specifying the principle that rules a machine that mixes. 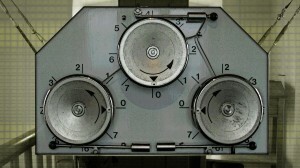 Mixing is a type of machinic principle. Remix is another step up in the spiral of rhythm machines that combine ready-made material into new instances. Today, remix can be found everywhere, it has become the form of production per excellence of our times. Lev Manovich has called attention to the remix in contemporary cinema, visual communication, and architecture in which the results are hybrid forms with an homogeneous and fluid surface, and an unreal aesthetic. If remixing is considered a machinic process, then is a different type of machine art. These forms of machine art cannot be approached based on the type of machine, usually algorithmic, neither they can be characterised by their particular set of visual forms. Rather we have to make use of the principle of combination in which what is being combined is less important than the process itself: the (re)combination. The contemporary machine art differs from that of Tatlin because is one of conversions and not of subversions.